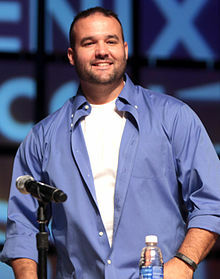 Austin St. John revealed on Friday he is in talks to return for the upcoming season of Power Rangers. St. John, who played Jason, the original Red Ranger, in Mighty Morphin’ Power Rangers, revealed at the fourth biennial Power Morphicon fan convention that he is in talks to return for Power Rangers Dino Charge in 2015. Dino Charge, based on Zyuden Sentai Kyoryuger, will be the third Power Rangers series to sport a dinosaur motif. It is currently unknown whether or not the actor would return to his iconic role of Jason or as a new character in the vein of Rick Medina, who played Cole, the Red Ranger, in Power Rangers Wild Force and later returned as an unrelated character in Power Rangers Samurai. Austin John is way mroe famous than Ricardo Medina. First, Austin has played in a total of four seasons (I count Wild force too, although it was only for one ep.) and he’s played Jason in all of them, while Ricardo has played only in Wild force and Samurai, in different character throughout the different seasons. I hope Austin returns as Jason!